Whirlpool WFW9400SZ Frontloader 27 inch washing machine 4.0 cu. ft. 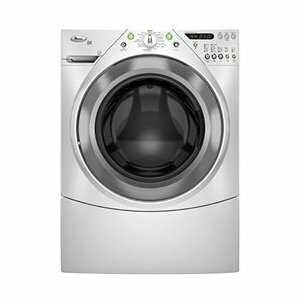 The Whirlpool WFW9400SZ washer is one laundry gadget that definitely spells hard work. Imagine washing 16 pairs of jeans in just one load! With that capacity, you can also save on utilities as this machine uses only half the energy and water. There are 14 cycles available, ensuring a perfect wash cycle for whatever fabric you put in the machine. Its advanced features include the 6th Sense technology with intuitive controls that adjusts perfectly, making sure you have clean clothes. The washer is an efficient and quiet hard worker, with dynamic stability control and a suspension system with 6 points that reduce instability, unnecessary vibration and noise. The 4-Tray Prewash, Detergent, Bleach, Fabric Softener dispenser is as good as any dispenser can be. Imagine dealing with these laundry implements without having to do those messy steps like measuring and pouring. No more messy and bleach-smelling fingers and no need for gloves. The wash basket , made of stainless steel, does not cause odors, rust, or paint chips to get into clothes. The smooth finish gently holds fabrics and durable enough to function for years. The fact that it can handle 4 cubic feet of laundry is not bad too, at all. It comes with a white finish and sapphire blue accents, making the machine look interesting and not just one of those usual boring-looking washers. The door window has a see-though area that lets you see through the inside of the washer, even when it is working. Additional features, including child lockout and door lock, prohibits accidents from ever happening - you can leave it to wash your clothes without having to worry about something bad happening with children around. Push buttons are placed neatly and an LCD screen is present to inform you of the status of the wash cycle. The overall layout of the control panel is very user-friendly. The large capacity of this washer is really something that pleases its users. A washer that has a 4 cubic feet capacity instantly means less laundry batches, less water and energy required, and ultimately less time, effort and money needed. Equipped with 5 Wash/Spin Speeds, there is surely one speed that would suit the type of load you are washing. Automatic Water Level Control makes it convenient for you to just do the laundry - no need to worry if there's too much or too little water as the machine takes care of it. Care Control Temperature Management and the five Temperature Selections make sure that the water temperature is right depending on the load you're washing. Items won't get damaged because the water was too hot or too cold. Special cycles such as the Sanitary Cycle And Clean Washer Cycle makes it possible for clothes to be 100 percent clean, and the washer itself, too. There are 14 Factory Pre-Set Cycles And Options to cater specially to any type of laundry item. Replacement parts may be a bit too pricey. Too may washing cycles can be overwhelming, not to mention complicated for some users. Comments for Whirlpool WFW9400SZ Frontloader 27 inch washing machine 4.0 cu. ft. I read the last review, and wonder if maybe they are making washers and dryers like Detroit used to make cars. Don't buy one made on Monday or Friday. I replaced a GE washer and dryer set almost 3 years ago with the WFW9400 Duet set. I run it an average of 6 to 8 times a week and I've never had a lick of trouble. My electric bill dropped by 10% and they are quiet and take care of my clothes. I have a 14 month old Whirlpool Modell 9400 washer. The main bearing decided to go out and since it is out of warranry it is going to cost what I paid for the washer to replace. Needless to say I am shopping for another brand. I also have 14 mo old model 9400 dryer. The drum has been replaced 3 times and the rollers once and it still thumps when running. Of course Whirlpool said that now that it is out of warranty, too bad. Needless to say Whirlpool is not the brand I am going to buy now.